Boon for law students: Penn State Dickinson School of Law announced this week a new program called the Commonwealth Scholars Program, which will provide renewable annual grants of $20,000 to law students whose primary residence is Pennsylvania. Onward State called the announcement “incredible news” and noted the law school’s recent accomplishments and recognitions, while the Pittsburgh Post-Gazette noted that a decline in law-school applications likely factored into the program. The grant is renewable for all three years of law school—a potential savings of $60,000—and Commonwealth Scholars are still eligible for other grants and financial aid. 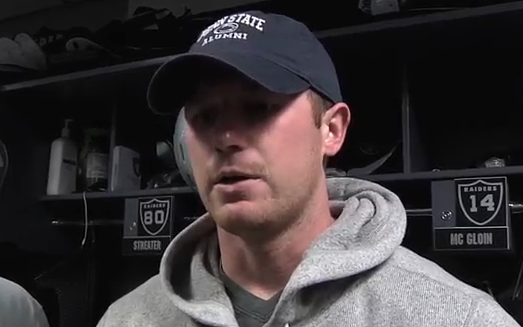 Matt McGloin clearly hasn’t forgotten his roots (@Onward State via raiders.com). “American underdog vs. America’s team:” The underdog in this ESPN.com headline is none other than Matt McGloin ’12, who will be starting at quarterback for the Oakland Raiders on Thanksgiving against the Dallas Cowboys—i.e., America’s Team. His amazing journey from walk-on at Penn State to undrafted rookie to starting NFL quarterback continues. I had to laugh at this line in the piece: “You have to wonder if the moment will be too big for him.” Yeah, I don’t think so. I guess the national media is still learning what we’ve found out over the past couple of years: Never, ever count out Matt McGloin. Maybe this game will raise McGloin’s profile a little more so that broadcasters such as Mike Francesca can get his name right. Enjoy your holidays! We’ll be back Monday, Dec. 2. Entry filed under: Uncategorized. Tags: Commonwealth Scholars Program, Lunar Lion, Martin Bucknavage, Matt McGloin.